Single sourcing is more than mechanical document conversion. It is an information development strategy. Although it is often confused with the process of converting paper-based documents into online formats, single sourcing is a writing strategy that enables technical writers to develop centralized information modules, then map them to distinct audiences and media. 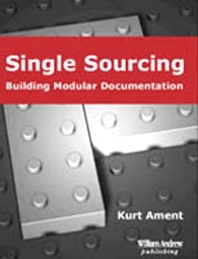 For technical writers, single sourcing means modular writing and information mapping. Rather than developing information for a given format, such as a user guide or online help, technical writers develop information modules at the element (section, paragraph, and sentence) level. They then map these information modules to preselected audiences and media. Technical writers and editors that want flexible framework for developing successful single-source documentation. Technical publications managers who want to standardize corporate publications to improve quality and save time and money. Teachers and students who want to learn successful single sourcing techniques that are actually used in corporate environments.